Does the eSIM signal the end for Telcos? Have you seen the news? The telco's are going to be dead in three year's time! At least that's the prediction of some commentators reacting to the arrival of the eSIM. Are they right? Will eSIMs down the telcos? The big three Australian telecom companies have managed the way we buy and use physical SIMs for the past two decades. They have used them to lock us into contracts, made it difficult to switch carriers or downgrade a plan, and at some points even charged us a fee for a replacement SIM card. The eSIM, which is poised to take the world by storm, will break down this traditional relationship and divest the telco's of this leverage over us. Will it result in the death of the telco? No, of course not. Will it severely disrupt the current relationship that telcos have with their customers? Yes, it most likely will. eSIMs will change almost everything about how we research, buy and use mobile phone company services. Once eSIM technology is widespread, in both mobile network carriers and devices, there will be a visible shift in how connected devices operate and how business is done. Therefore much of the infrastructure which currently surrounds carrier companies is likely to change substantially in the next 5 years. The game-changer and true potential of eSIM technology is that mobile devices will no longer be "locked" to a carrier network. In the new eSIM world, switching from one provider to other will be able to be done with only the tap of a finger, rather than requiring the removal of one SIM card and switching it out for different providers. eSIM will make it easier for consumers to have multiple pay-as-you-go contracts from different providers on a single phone.They could switch to the cheapest rate depending on where they are. Apps that function as brokers could monitor and negotiate which network to select based on best price. A global eSIM specification has been backed by Apple, Samsung, Microsoft, Huawei, Sony, and LG, along with chip makers, SIM makers, and telecommunications carriers. 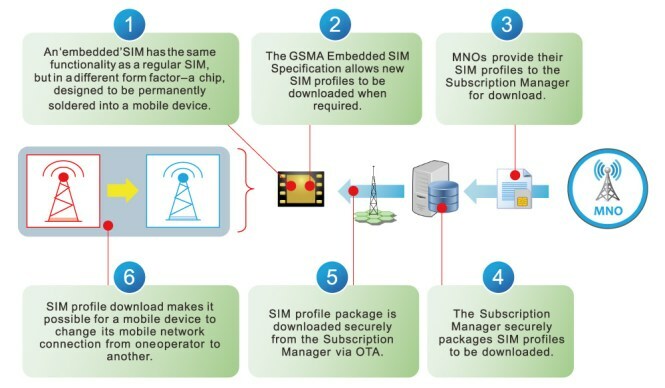 The initiative does not aim to replace all SIM cards in the field, but is designed to help users connect multiple devices through the same subscription. Initially the aim is to allow mobile device manufacturers to develop a new range of smaller, lighter mobile-connected devices that are better suited for wearable technology applications. Mobile phone manufacturers will be able to leverage a new relationship with mobile/telecom carriers who have traditionally exercised control over the device market. Instead of manufacturers having to negotiate with telecom carriers to deliver their products to the shelves then onto the customers, they will be able to leverage eSIM and establish a direct connection to the retail market. Manufacturers, like Apple and Samsung, will be able to sell their products through their branded online stores, offering users a choice of subscription with eSIM. As the Telstra One Number product name suggests, it allows customers to use the same phone number across their wearables as they use for their smartphone, and allows the sharing of data, calls, and texts inclusions from their mobile plan. Telstra is offering a 3-month free trial of One Number and thereafter the service will be charged at $5 per month on a casual basis.